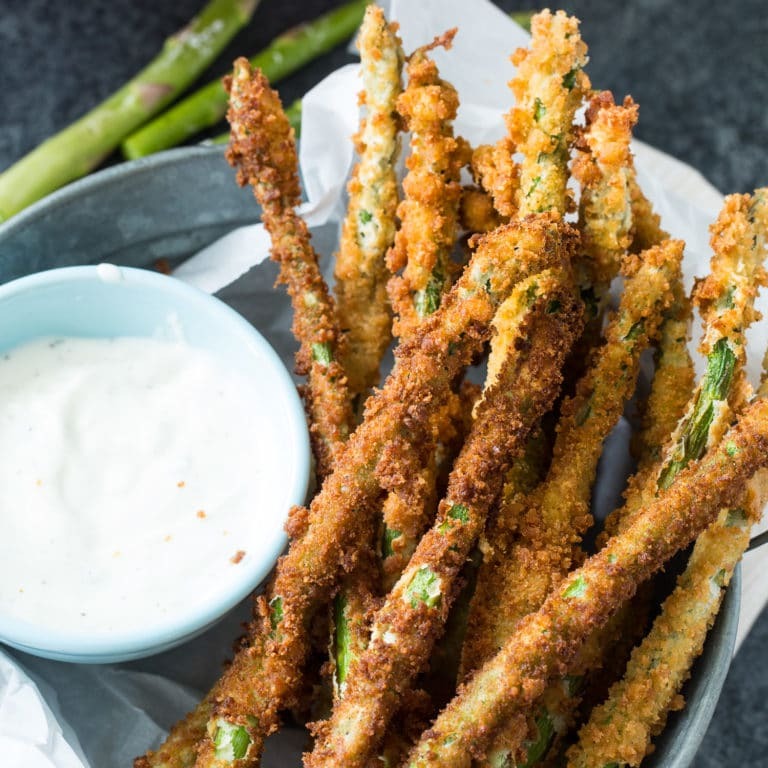 Fried Asparagus has a super crunchy coating covering crisp tender fresh asparagus stalks. They make a great spring appetizer served with ranch dressing for dipping. 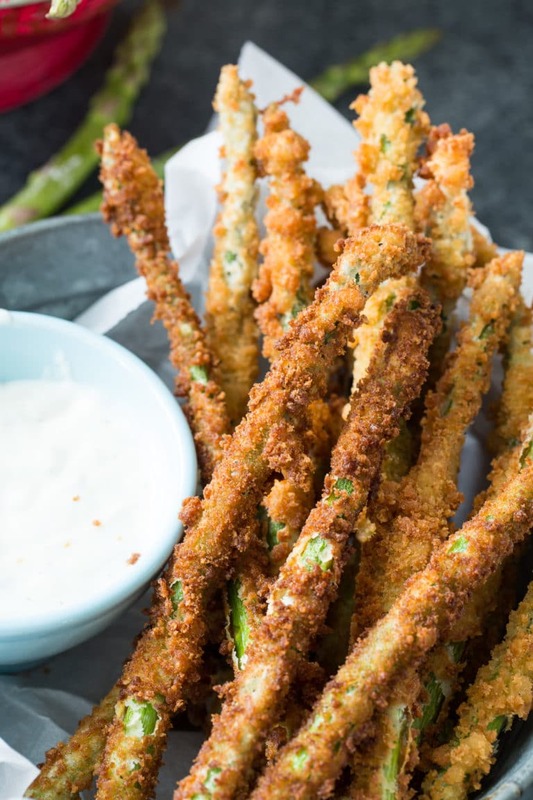 Even if you don’t care for asparagus, you will love these Fried Asparagus Spears. I think I like them even better than Fried Green Beans. Trim the woody ends off, about the last 1 1/2 to 2 inches. You want to use medium-thickness stalks. Thin asparagus will cook to much and get too soft. Rinse the asparagus, but do not dry off. Immediately coat them in flour. The water will help the flour adhere. Next dip them in an egg wash, coating them well. Then add them to a ziptop bag with a homemade bread crumb mixture and seasonings. To fry them, use peanut oil, or vegetable or canola oil. You want the oil temperature to be 350 to 360 degrees. A thermometer is handy for keeping the temperature right. You want to fry them in batches so you don’t crowd the pan and drop the oil temperature too much. 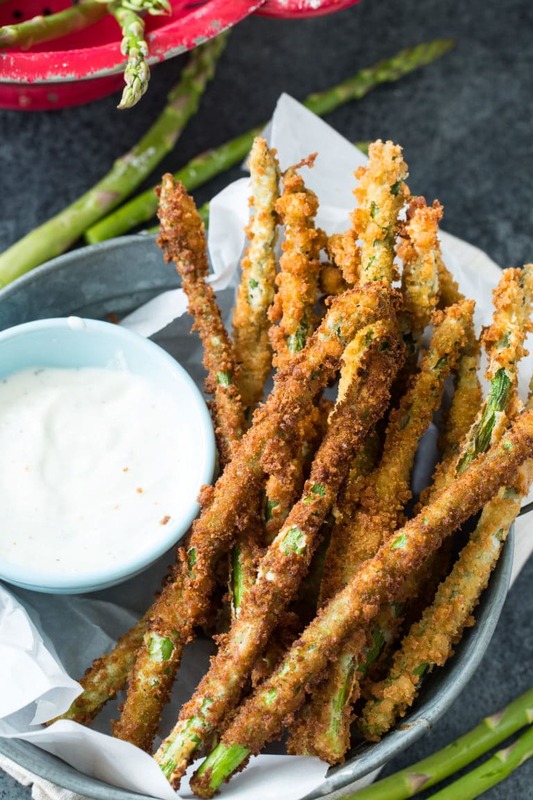 Fried Asparagus has a super crunchy coating covering crisp tender fresh asparagus stalks. They make a great spring appetizer served with ranch dressing for dipping. 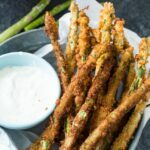 Even if you don't care for asparagus, you will love these Fried Asparagus Spears. Place 1/4 cup of flour in a shallow dish. Or you can use a paper plate for easy cleanup. Combine the 3 tablespoons flour, bread pieces, salt, pepper, and cayenne in a food processor and process until finely ground. Transfer mixture to a large ziptop bag. Whisk together eggs and 1 tablespoon of water in a shallow dish. Rinse asparagus, but do not dry. The water will help the flour to adhere. Coat them in flour, dip them in egg wash and then 2 or 3 at a time, place them in the bag and shake to coat with bread crumbs. Lay them on a baking sheet until ready to fry. Line a plate with paper towels and pour at least an inch of oil into a Dutch oven. Heat oil to 350 degrees. Fry asparagus in batches for 1 to 2 minutes, until golden brown. and then place on paper towel-lined plate. This entry was posted in Appetizers, General and tagged asparagus. Bookmark the permalink. may i ask what is the reipe for the fried aspragus dip ? FAB U LUS LOVELOVE FRIED ASPARAGUS.MMMMMGOOD. THANKS FOR YOUR WEBSIGHT LOVE IT. I SCAN IT QUITE OFTEN. THANKS GOOD JOB U GUYS. wrote down how to for **GRANNY CAKE** now I can’t FIND MY! Where is it your vast collection? ?